This year, Chef/Owner Robert Baker of “Me and the Hound Memphis Barbecue” will be at the Festival. He was born and raised in Memphis and has participated in the Memphis in May World Barbecue Championship for many years. He brings his love of slow cooking to Monterey. What’s more fun than a Celebrity Food and Wine Event? 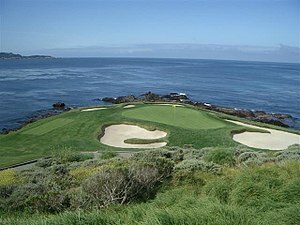 Especially when the proceeds benefit worthy organizations and the venue is scenic and legendary Pebble Beach. 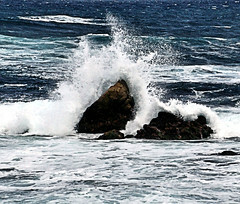 Pebble Beach boasts a dramatic coastline nestled among majestic Monterey pine trees. 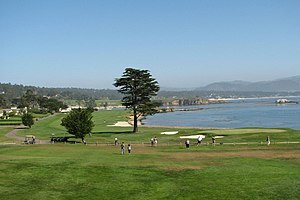 It is a golf mecca; the Pebble Beach Golf Links in Monterey, California opened in 1919 and is regarded as one of the most beautiful courses in the world. 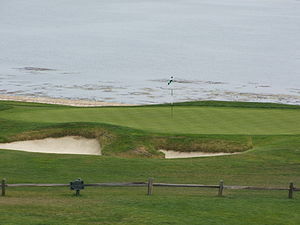 In 2001, it became the first public course to be selected as the premier Golf Course in America by Golf Digest. Greens fees are among the highest in the world, at $495 per round. The area offers incredible accommodations. Pebble Beach Resorts like the Lodge and the Inn at Spanish Bay offer extraordinary amenities like with world-class golf courses like Spyglass Hill and The Links at Spanish Bay. There is a spa as well as a Beach and Tennis Club. One of the best Vino con Vista sea-front dining opportunities that you can seize, is at Roy’s Hawaiian Fusion Restaurant in the Inn at Spanish Bay. Gaze at the Pacific Ocean from the dining room or the outdoor tables. 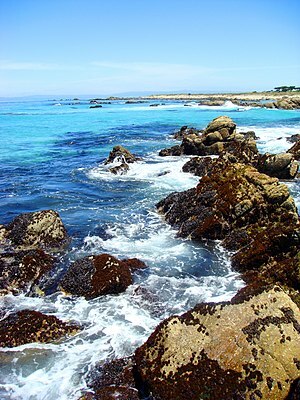 Wander over to Big Sur or the Monterey Aquarium. 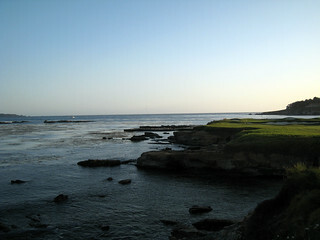 There are plenty of interesting sites to visit around the Monterey Peninsula. The Pebble Beach Food and Wine Festival enables guests to try cuisine from many restaurants. 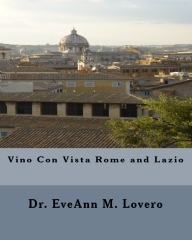 You can taste new wines like “Cherry Pie” that I have never seen in Chicago. This distinctive Woodbridge single vineyard, single varietal Carneros Pinot Noir was delightful! 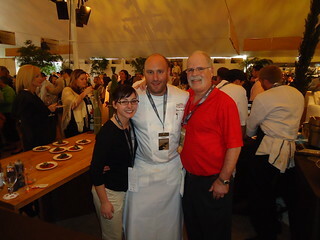 I loved the 2012 Pebble Beach Food and Wine Festival!! 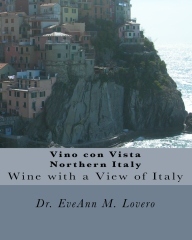 This 5th annual premier epicurean event in California was an incredible Vino con Vista Opportunity! Mark your calendars for the 6th annual event, it will be held on April 4-7, 2013. 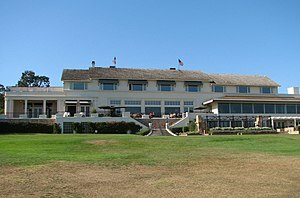 The 2012 Events were held at luxurious Inn at Spanish Bay, Pebble Beach Golf Links and The Lodge at Pebble Beach. There was even a Jenn-Air Pavillion set up on the grounds of the Inn at Spanish Bay for cooking demos. The Grand Tasting was at the Equestrian Center. Shuttle service was provided between the different event locations. Participants learned about “Cult Cabs” and had a meal with Michael Chiarello, who specializes in Italian-influenced California cuisine. 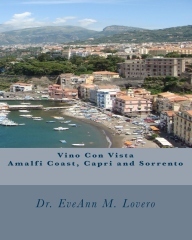 There was “Swine and Wine” and “Italian Love Affair” tasting. Guy Fieri and other notable chefs were hosting cooking demonstrations. 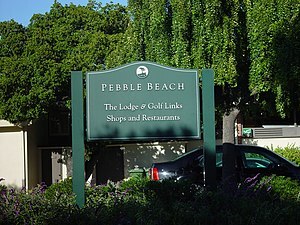 There was an opening night reception and plenty of “After Hours Parties.” You could even sign up to play golf on Pebble Beach! 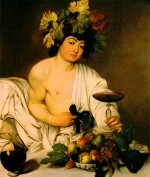 The Grand Tasting Events were held on Saturday and Sunday. 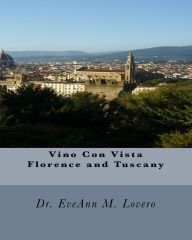 There were 250 acclaimed wineries and 75 celebrity chefs with plenty of wine tastings and cooking demonstrations. I went to the Sunday “Lexus Grand Tasting” at the Equestrian Center with 25 celebrity chefs showcasing their culinary prowess. 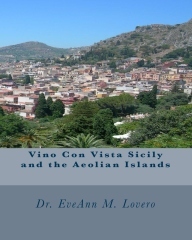 There were book signings and over 300 wines from 200 of the world’s most prestigious wineries. I even had an opportunity to try “The Black Bottle” iconic wine. 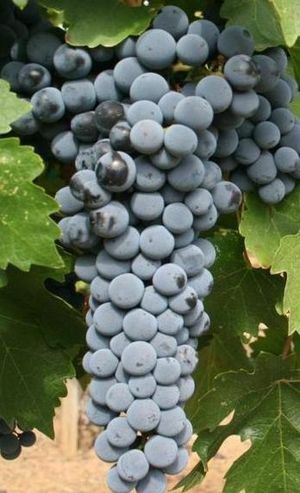 I always search for new Pinot Noirs to try. 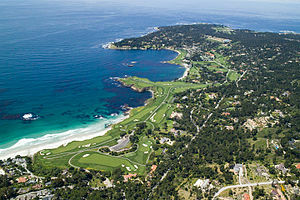 Follow this link for more information about this premier culinary event in Pebble Beach California.